Adam joined the Academy of Ideas in October 2014, having graduated from the University of St Andrews, where he studied modern history. He was partnerships director for the Academy of Ideas, working at a senior level on the Debating Matters project the Battle of Ideas. 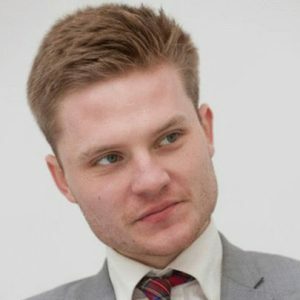 He led the Debating Matters Beyond Bars project at HMP Birmingham for two years and has produced debates at the Battle of Ideas on everything from dating apps to ‘killer clowns’. A proud Prestonian, Adam competed in and won the 2010 Debating Matters National Final with Hutton Grammar School, going on to achieve success in the International Final against the Indian champions. In his spare time Adam is a keen NFL fan and vice-captain of the world-famous Black Squadron FC. He moved on from the Academy of Ideas in the summer of 2018 to pursue a career as a prison officer.